On April 1, 2019, Chris Chant went to be with our heavenly Father to help with the leading of songs and keeping everyone in line with love. Chris was born on October 12, 1943 in Newport, Rhode Island and left when he was six months old or as fast as he and his parents could get back to Texas. Chris attended first through twelfth grade in Devine, Texas and graduated with the class of 1962. He also played football and was on the 1960 Warhorse state semi-finalist team. After he graduated, he then went to Southwest Texas Junior College (SWTJC) in Uvalde, Texas where he played basketball and also was named Mr. SWTJC. After two years, he transferred to Texas A&I (now A&M) in Kingsville, Texas where he graduated with a Bachelor’s of Science in Agriculture. Then for three years he taught in Lytle ISD in Lytle, Texas. During this time, he met and married Elizabeth Cooper on August 16, 1969. Chris continued his education and attended Southwest Texas State (now Texas State University) in San Marcos, Texas and graduated with a Masters in Administration. While at SWT, he taught at Lockhart ISD in Lockhart, Texas. In 1972, he moved his little family to Eola, Texas where he taught for eleven years. Chris then moved to Eden CISD when the schools consolidated. He wore many hats at these small schools. Family and friends recognized his joy in being a teacher, principal, assistant superintendent, driver’s ed. instructor (oh the stories he could tell! ), custodian, night watchman, coach, and drove a school bus for 50 years. Chris initially retired in 2002, but was back at school within just a few months, part-time. He finally retired in 2009 but his desire to work with young people continued. Occasionally he drove the band bus and was a member of the Eden Childcare Center Board where he was serving as president. Chris was a strong and devout Christian. For almost 41 years, Chris preached each Sunday morning at the Paint Rock Church of Christ. 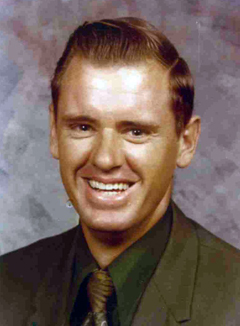 He was also a member of the Eden Church of Christ and served as an elder. Chris loved nature and was an avid outdoorsman. Most of all he enjoyed hunting and fishing, but had to give up these favorite past-times over the last few years. This was difficult for him, however, his knowledge and enjoyment of the outdoors continued in conversations with friends and relatives. This included stories about capturing rattlesnakes for the Sweetwater Rattlesnake Roundup. Chris was preceded in death by his father, Novie Ernest Chant and mother, Altah Lee (Tenny) Luce Chant. Survivors include his wife of 49 years, Elizabeth (Cooper) of Eden, Texas; son Rodney Chant and wife Kristy of Pasadena, Texas and their sons Brady of Lubbock, Texas and Zachary, also from Pasadena; daughter Rebecca Hamilton and her daughters Chloe, Andrea (AJ) and Michaela of Lubbock, Texas; son Tray Chant, his wife Susan, and daughters Carrie and Emily of Waxahachie, Texas; brother Ivan Chant and wife Jalyne of Devine, Texas; sister Carolyn Wiemers and husband Duane of Hondo, Texas; sister Glenda Allen and husband Kenny of Devine; and numerous nieces, nephews, and cousins. A memorial service to celebrate Chris’s life will be held on April 27 at 2:00 pm in the Eden High School Auditorium. Memorials may be made in Chris’s memory to Eden Public Library, Eden Childcare Center, Eden EMT, Cherokee Children’s Home (Cherokee, TX), Devine Dollars for Scholars (scholarships), or the charity of your choice.